This is a question that is more common than you’d imagine, and one that many men are too embarrassed to ask: ‘what’s the difference between a Tuxedo and a Suit?’ You likely know the visual differences between the two, though are you fully aware of the etiquette involved? Do you know exactly when it is appropriate to wear a tuxedo and when it is not? It can get confusing, because let’s face it: how often does the average man have to wear a suit or tuxedo? Unless you’re in the tailoring industry, a businessman or you’ve been married too times then it’s incredibly easy to get the two mixed up. 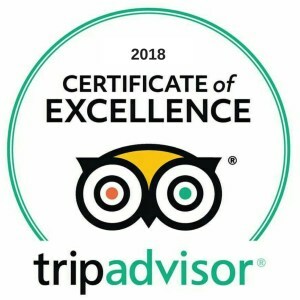 But don’t worry, we have put together a couple of key points that will not only help you differentiate between the two; but also serve as a guide on which is best suited to various events and occasions. Tuxedos are typically accepted as formal evening wear, and while they are still technically classed as a suit, they are more formally known as a ‘dinner suit’; used in events such as weddings, balls and ‘black-tie’ events. In fact, did you know that it is actually considered inappropriate to wear a Tuxedo before 5:00pm? That may appear to be rather a strict rule of thumb, though that’s the way it has been for a long time; it’s what adds to the charm of wearing a Tuxedo to a special event. Suits on the other hand are considered (out of the two) to be more informal. If you were to meet a friend for coffee in the morning wearing a suit, people would just assume that you were on a business meeting which is perfectly acceptable – turn up in a Tux on the other hand, and you’ll likely be on the receiving end of a strange look or two. The important difference to remember is that Tuxedos are strictly reserved for special events. You could get away with wearing a suit at the majority of these special occasions, though a Tux sends a much better message; one that clearly conveys ‘VIP’. Tuxedos as you may have already gathered, aren’t for everyday – And with good reason: a Tuxedo wouldn’t be any good for special occasions if you were able to wear them to any old event and get away with it. But what actually constitutes a special occasion? You can wear a black suit to a funeral, so why not a Tuxedo? Well, whilst a funeral is most certainly an important event, you wouldn’t exactly class it as a special occasion. 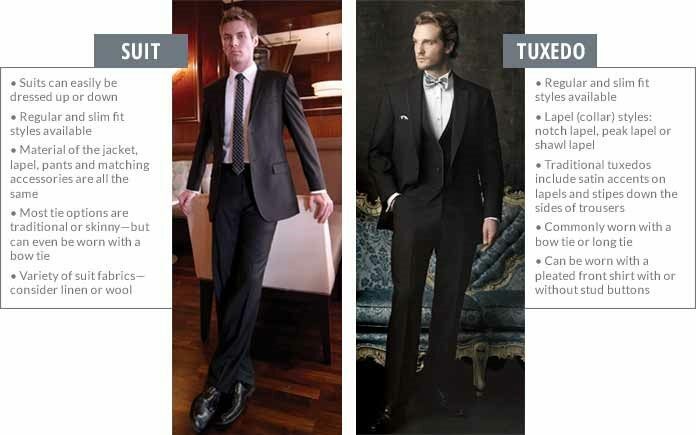 You see, Tuxedos are typically intended for joyful events, whereas suits offer a little more flexibility (in both design and function – see Figure 3) So to summarise: Tuxedos are for special events and are designed to draw attention to the fact that you are an important person, worthy of note who is celebrating something important ie; a wedding or a charity ball. Suits on the other hand were more purposefully designed for the less formal day to day events such a business meetings, birthday parties and eating out. You can literally wear a suit every single day and get away with it if you wanted to, as they offer a great deal of flexibility, though people may argue that you’re terribly over dressed for grocery shopping. Tuxedos tend not to vary so much in design. In fact, apart from the traditional stripe down the side of the leg, the satin lapels and the cummerbund waist covers; there tends not to be much variation besides colour, and of course quality. Tuxedos are typically in dark blue or black, though they have been known to be worn in other colours. Most people stick to the traditional Tuxedo, though in this day and age there is always room for a little customisation if you are feeling brave enough. Suits, again offer a very different story – you don’t even have to wear a tie with your suit if you don’t want to. It all depends on the event that you are going to. Suits are often used as casual, and come in all manner of fabrics, patterns, colours and design. All that being said, just because suits are typically viewed as being more informal when compared with Tuxedos; that’s not to say that wearing a suit to a wedding is considered inappropriate. In fact, in this day and age more and more people are opting for a more relaxed approach, allowing them the freedom to express their individual styles- It all comes down to personal preference at the end of the day. Tuxedos are traditionally more expensive than a suit, given that they tend to have more expensive and ‘fancy’ materials used, such as satin for example. This is why many people opt for renting a Tuxedo for a special event, though there is something charming about having your very own personalised and tailor-made Tuxedo – you’ll just have to invite yourself to as many weddings as often as you can. Suits again, are generally a bit cheaper than Tuxedos, though this price varies massively. You can buy a half decent off-the-rack suit for a reasonably fair price, or go all out and spend on a stunning tailor-made suit. Obviously it all depends on how good you want to look, how often you plan to wear your suit and what design, style and materials are being used. Whatever the case, whether you’re buying a suit or a tuxedo; just make sure to have the fit tailored to your individual body shape. Renting or purchasing off-the-rack is alright for a last minute fix, but if you are looking to purchase something for yourself then it is always much better to go the extra mile and have a tailoring specialist craft you your very own, personalised threads.